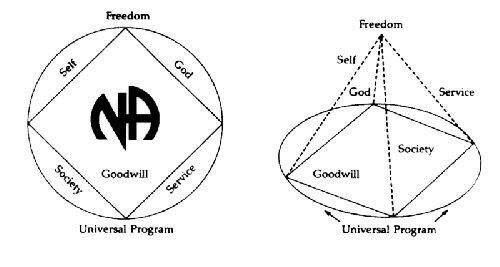 Consisting of a four sided pyramid, rising to the point of freedom the four sides include God, Self, Society and Service. Finding a balance is the goal of the recovering addict. Without all four sides, the recovery experience is incomplete. There are many ways to be of service in the NA program regardless of your level of expertise or experience, as well as many opportunities to learn new skills. Once you begin your journey in service, not only do you begin to give back to the program, you will have the opportunity to develop a passion that you previously have not been able to experience.